Our investment accounts have now hit another financial milestone, surpassing $450,000 in value! This includes money in our 401Ks, Roth IRAs, taxable accounts, and 529. This does not include money in our checking accounts, savings accounts, home equity or rental property equity. As we continue on our journey towards financial freedom, we have been focusing more on being in the moment and enjoying the time we have available. Years ago, we did a lot of the heavy lifting with improving our finances by cutting our expenses dramatically, and slowly increasing our investment contributions, sometimes as little as 1% at a time. This has created a snowball effect of our investments compounding aggressively over time. Our investments are simple and our contributions are automatic. Our money continues to make more money for us. We just got back from a 4-day trip to visit San Diego, and it was a nice surprise to see our investment account balance after coming back from our vacation. Our investments haven’t changed much since we first began saving. We invest in index funds that track the US stock market (63%), international stock market (27%), and US bond market (10%). Index fund investing allows us to diversify our portfolio and keep our costs very low. While we have hit a new all time high in our investments, this could all change in an instant. Regardless of stock market volatility, we stay the course with our investments by consistently contributing through stock market ups and downs. We know that there is no way to accurately time the stock market; so we just hang on for the ride. How is your financial freedom progress going? The great thing about doing side hustles to generate extra income is that you can hustle on your own terms. The more hard work, time, and creative effort you put in, the more extra money you can make. You can hustle as little or as much as you want, whenever you want. It’s your extra money, and you can choose how you want to spend it. Instead of focusing on what ideas don’t apply to you, try focusing on different side hustle ideas that you can implement to work for your situation. Once a month (usually on the 1st), I like to post a short summary of our personal and financial situation for the previous month. While I don’t often post articles, I am committed to documenting all of my side hustle income. Here I’ll share some of what’s been going on with our lives and our side hustles. Welcome to April! Did you have a good March? The weather has been great in Southern California with plenty of sunshine well past 7:00pm. Looking back, we spent much of the month outdoors on long walks and playing in the park around our neighborhood. Sometimes I get annoyed at how much our property taxes cost each year ($7,588) and how much our HOA dues cost each year ($2,040), but then I experience the wonderful walking paths and playgrounds we have access to just outside our front door. I am thankful to be a part of our neighborhood and community. 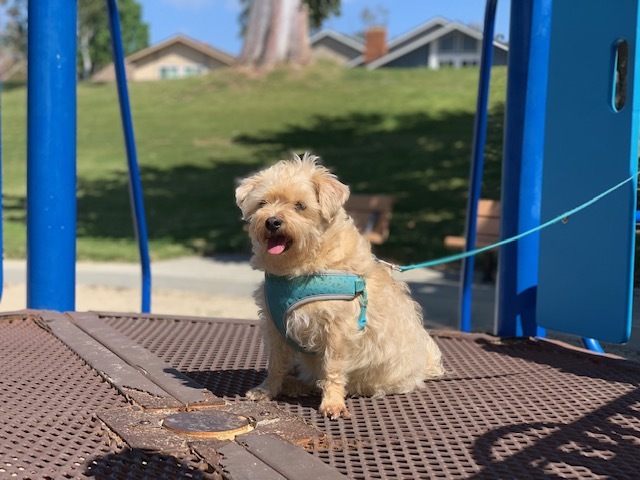 Abby waiting patiently at the playground while our kids play in the sand. Our kids continue to grow so quickly. Our son will be 4 years old soon and our daughter is already 15 months old! They love spending time outside, reading, and playing with their toys. We continue to try to make our time with family as joyful as possible. It’s not easy when our kids fight with each other or when our son refuses to share and play nicely with others, but it’s all a part of growing up. We continue to work hard as we push towards our financial freedom. Here’s our monthly summary of side income that we have generated in the previous month of March. On 3.1, I received $10.23 deposit in my Discover Cashback Checking account. This is 1% cashback from paying our rental property with my Discover debit card. On 3.1, I received a $4.00 statement credit on my Freedom Unlimited credit card from Chase Offers. Chase now offers special cash back promotions on purchases made from participating retailers, sort of like American Express Offers. This was 5% off purchases made at Kriser’s, a local pet store we get dog food from. On 3.5, we received a net profit of $450 from our rental property. On 3.29, I received a direct deposit of $187.50 for teaching at the local university. Teaching continues to be one of my favorite side hustles. On 3.16, I received a $10 check from E-Rewards Medical for completing a medical survey. On 3.23, I received a $10 check from E-Rewards Medical for completing a medical survey. On 3.26, I received a $20 check from My Impact Network for completing a medical survey. On 3.28, my wife received a $10 Amazon gift card for completing an Amazon survey. All of this totals $701.73 from our side hustles for the month of March! Our side hustle income has been on a downward trend lately. I’ve been choosing to do less work, as I want to focus on being with my family more.